The Nikon 1 J1 offers most of the key features of its more expensive and bigger, the V1 model, in a smaller, lighter and cheaper package that is even more clearly targeted at people upgrading from a compact. It also shares the same idiosyncracies, however, regarding its low-light focusing and user interface, and it suffers in direct comparison to the V1 by not having an electronic viewfinder, accessory port, high-resolution LCD screen, mechanical shutter and longer battery life. Still, in our view the J1 is a better fit in many ways for its intended audience who will perhaps appreciate the built-in flash, simple control layout, stylish looks and svelte dimensions rather more than some of those so-called "missing" features. Just like the bigger and more expensive V1, the J1 is perfectly capable of keeping up with the action thanks to its hybrid AF system and ultra-fast continuous shooting modes. In good light, the Nikon J1 is indeed as fast as anything out there when it comes to auto-focus speed. Its headline-grabbing 60fps burst mode might not be quite as useful as it may sound, but the fact that it can shoot at 10fps and keep the subject in focus is still sensational, especially if you consider that we are talking about a camera that’s quite a lot smaller than a typical SLR. On the other hand, low-light focusing is less than stellar, and there are some other areas of performance where there's still room for improvement. Also, whether the intended beginner audience actually want interchangeable lenses - and if so, whether they are ready to pay the rather high price that price Nikon is asking for the J1 and its assortment of optics - is an entirely different question. While the Nikon 1 J1 is a good camera for beginners, it's not so well-suited to serious amateurs. The J1 is a very small, high-quality, discreet and generally fast camera but its interface is quite clearly not geared toward users who like to take full control of the picture-taking process. Most of the features these photographers want are there, but too many of them are buried within the menu, which is bound to be a source of frustration to any power user. Small firmware changes, such as making the "F" button customisable and/or the self-timer button reprogrammable could make the Nikon J1 more appealing to this group, but the J1 will never be able to overcome its reliance on the LCD screen for image composition or the lack of an accessory port for some of the more interesting extras like a powerful external flash or the GPS unit. 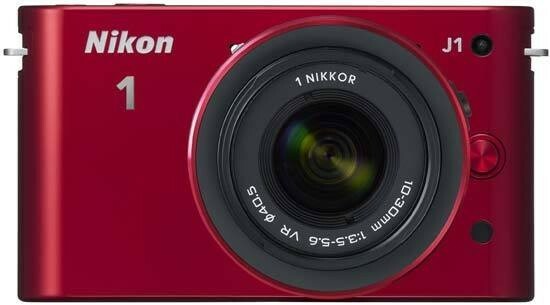 The J1 may only be the junior member of the Nikon 1 family, but its significantly cheaper price and more targeted approach make it a better choice than the V1 for compact camera users looking to upgrade to a more advanced system. It is still expensive though compared to rivals like the Sony NEX-C3, Olympus E-PM1 PEN Mini and the Panasonic Lumix DMC-GF3, so you'll need to decide if the out-and-out speed and beginner-friendly approach are really worth the price of admission.